Skin does so much in so little space. It protects the body against most physical, chemical, and microbial threats and yet maintains an exquisite sensitivity to touch, temperature, and pain. It achieves this and much more in less than one millimeter (about 1/25/ of an inch) of average thickness, with a layer of nearly impervious dead cells covering the living cells. Skin's highly economical construction consists of two layers, the epidermis and the dermis. The epidermis (outer layer) is very thin, waterproof, and abrasion-resistant and contains important pigment-producing and immune cells. The thicker, denser dermis is tougher than the epidermis and contains most of the skin's plumbing and wiring, including blood vessels, sweat glands, sensory receptors, and hair follicles. Skin color comes from several substances, which are visible to varying degrees in different people. For most of human history, people did not know exactly how skin got its color, so they spun creative tales and theories to explain it. Many of these explanations were ingenious products of astute observations, like that of the Greek philosopher Hippocrates, who ventured that skin became darker when it was parched by the sun over time. In lightly pigmented people, the skin gets most of its color from blood and from the bluish-white connective tissues of the dermis. The red color produced by circulating hemoglobin becomes more obvious, especially on the face, when the small arteries in the skin expand and become engorged with blood. This is the classic blush. After long bouts of vigorous exercise, the face becomes flushed and sweaty as blood is pumped to the surface of the skin to supply the sweat glands with needed coolant. The most uncomfortable reddening occurs when people flush red with embarrassment or anger. When people "drain of color" as the result of fear or anxiety, the blood vessels narrow and reduce blood flow to the skin. Although hemoglobin contributes to skin color, the most important substance imparting color to skin is melanin, which is a pigment produced in specialized skin cells. In moderately or darkly pigmented people, melanin provides most of the remarkable range of brown hues. Melanin is the collective term for a large family of molecules that can absorb visible light until they become dark in color. The unique chemical configuration of melanin also makes it protective against a variety of noxious environmental elements. It is found in a tremendous array of organisms, including fungi (figure 1; box 1), and its ubiquity in the natural world testifies to its long history and versatility. Melanin is one of many compounds that are repeatedly recruited during the course of evolution because they do their job well and usually only require minor tweaking through natural selection to be modified for new functional roles. Eumelanin is the dominant pigment found in human skin, and I generally refer to it simply as melanin. The most important pigment in the animal kingdom, eumelanin both protects the body and gives it color. Its basic building blocks are chemically simple, but these chemical constituents are bound strongly to proteins in the body to make large, linked molecules, or polymers. Eumelanin polymers take on different physical configurations and are remarkably stable. This stability is essential to their function and makes them hard to study: even when bombarded by high-energy radiation or free radicals, eumelanin molecules don't fall apart. There are many kinds of eumelanin, each with a slightly different structure and resulting color. Eumelanin is remarkable for its ability to absorb a wide range of the wavelengths of radiation generated by the sun, and in particular the higher-energy and potentially damaging wavelengths of solar radiation beyond the visible spectrum, collectively known as ultraviolet radiation, or UVR. Ultraviolet radiation can damage biological systems by breaking the chemical bonds that hold together important molecules, including DNA. This causes a toxic cascade of events in cells that involves the production of "free radicals"-highly chemically reactive atoms or molecules with free electrons that can bind to other molecules-which disrupt normal chemical reactions in cells. When UVR strikes eumelanin, it absorbs the radiation without breaking down. This makes eumelanin a powerful sunscreen. Besides blocking damage through physical absorption of UVR, eumelanin prevents free-radical formation and neutralizes free radicals that do form. This is why it is also classified as an antioxidant. Eumelanin's superior antioxidant properties are put to the test not only in the skin but also in less obvious places like the eye. There, eumelanin is one of the main components of the membrane just underneath the retina, which is the light-sensitive layer at the back of the eyeball. The retina is constantly bombarded with radiation in the forms of visible light and UVR. The delicate cells of the retina are largely spared damage, however, because the eumelanin in the layer below works to prevent free-radical damage. It is thought that other forms of melanin, tucked away in hidden parts of the inner ear and brain and thus not exposed to any light, may perform similar functions. All melanins are produced in specialized cells called melanocytes. In the skin, melanocytes are found at the lowest level of the epidermis, at the junction with the dermis (figure 2). Melanocytes come to this position early in the development of the embryo, after their precursor cells migrate into the skin. At this point they establish connections with their neighboring skin cells, called keratinocytes. All babies are born quite pale: although melanocytes start producing melanin early in fetal development, they don't work at full capacity until puberty. Melanin is made within small, membrane-bound packages called melanosomes. As these packages become full of melanin, they move into the slender projecting arms of the melanocyte and from there are transferred into adjacent keratinocytes. Under normal conditions, melanosomes aggregate on top of the nucleus of the keratinocyte and form a protective cap over the genetic material contained in it. One melanocyte supplies melanin to about thirty-six keratinocytes in an intricately choreographed process that is directed by signals from the keratinocytes. These cells also regulate melanin production and melanocyte replication. This is important because disruption of the relationship between melanocytes and keratinocytes wreaks havoc on the body. When melanocytes lose contact with their controlling keratinocytes, they start dividing rapidly and can break free from the confines of the skin altogether and initiate one of the most dangerous of skin cancers, metastatic melanoma. These processes are controlled by genetic and hormonal factors, but in most people they can be accelerated greatly by exposure to UVR. People have different skin colors mainly because their melanocytes produce different amounts and kinds of melanin. The genetic mechanisms of melanin production involve the regulation of a series of chemical pathways largely governed by the enzyme tyrosinase. Differences in skin color are also caused by differences in the size and distribution of melanosomes in the skin. People with naturally darkly pigmented skin have melanosomes that are large and filled with eumelanin. Those with naturally pale skin have smaller melanosomes that contain varying amounts and kinds of eumelanin as well as of its lighter-colored cousin, pheomelanin. Like eumelanin, pheomelanin varies in its structure, and its color ranges from yellow to red. It is most obvious in the hair of people from northern Europe (and the British Isles) and in the luxuriant coats of animals like golden lion tamarins and Irish Setter dogs. Pheomelanin not only looks different from eumelanin but acts differently too. Whereas eumelanin is an antioxidant that quenches harmful free radicals produced by UVR, pheomelanin actually produces free radicals when hit by UVR and so can further damage DNA and other components of living skin cells. Subtle variations in skin color-the reddish, yellowish, bluish, and other hues that are often remarked on in artistic representations of human skin-are due to different proportions of the different forms of eumelanin and pheomelanin in the skin, and most people have both types of melanin in their skin in varying ratios. Pigment can be unevenly distributed over the surface of the body, and an obvious example of this is freckles. Freckles are small, flat spots of melanin that develop in a random pattern on the skin in response to repeated sun exposure. Occurring mostly in people with very lightly pigmented skin, they vary in color from yellow to dark brown. Ephelides are the type of freckles that most commonly appear on the faces of children. They can occur elsewhere on the body if the skin is exposed to sunlight for longer periods. These freckles can fade if the skin is protected from the sun for a while, and they often disappear entirely by the mid-teens. Sometimes, though, they persist in fair-skinned people who are routinely exposed to strong sun. Another type of freckle is "liver spots" or "age spots" (solar lentigines) that appear on the hands and faces of older people. These tend to be darker than childhood freckles and occur in people with a wide range of skin colors as the result of sun damage. They do not fade, and their persistence is vexatious to many people as they age. Skin bleaching preparations are marketed to eliminate these marks, but this treatment is often not effective. Large anomalies in the production of melanins in human skin usually leave conspicuous traces. Because the absence of normal skin color on part or all of the body can affect a person's health and self-image, extensive research has been conducted on these afflictions. Absence of pigmentation can arise for many reasons. Various types of albinism are due to genetic mutations affecting different parts of the pigment production pathway or melanocytes in different parts of the body. Melanocytes can be entirely absent or fail to produce melanin, or melanosomes can fail to mature and be transferred into keratinocytes. The end result is the same: no pigment. When the ability to produce pigment in the skin is lost in patches on the body, the result is a condition known as vitiligo. Albinism is better known and is the collective term for many conditions that reduce pigmentation. Africa is home to people with many hues of brown, melanin-rich skin, but it is also home to many people with albinism, who have greatly reduced levels of melanin. They tend to stand out more in Africa because their pale skin, hair, and eyes contrast strikingly with the features of most of the people around them. Some types of albinism affect just the skin and hair; others affect the skin, hair, and eyes, or just the eyes. All are caused by different genetic mutations involving pigmentation. One of the most common types is oculocutaneous albinism, or OCA, which has many subtypes of varying severity that are caused by different genetic mutations (box 2). Albinism, especially the OCA2 type, is a serious health problem in Africa because people with albinism are more susceptible to the harmful effects of UVR exposure, including extreme sun sensitivity, skin cancer, and eye damage (figure 3). They also face serious social discrimination because of their appearance. In recent years, this discrimination has taken a dramatic and grisly turn, with dozens of people being killed in ritual murders in Tanzania and neighboring Burundi. Local witchdoctors aver that the limbs, hair, and blood of people with albinism are potent ingredients for magic charms, which are said to bring success in business and in gold prospecting. Prices for magic concoctions mixed with ground-up organs taken from people with albinism reportedly start at US$2,000, and witchdoctors involved in the sale of products made from albino body parts are said to belong to powerful networks across East Africa. Despite well-publicized trials and government crackdowns against the perpetrators of these crimes, a climate of fear exists in among people with albinism in Africa. In doctors' offices and in scientific studies of skin pigmentation today, objective and reproducible measurement of skin color is important. This was an imperfect art for centuries. The earliest classifiers of humankind, working in early-eighteenth-century Europe, used simple and imprecise color words like yellow, red, black, and white to describe skin tone. They had not observed non-Europeans in person but had only read explorers' and traders' reports of journeys to distant lands. By the late 1800s and early 1900s, it was evident that a more nuanced system was necessary to describe the many hues of human skin, and it was then that European scientists began to develop numerical codes for describing skin tone. These systems made use of numbered strips of painted paper or numbered tiles of colored enamel in different shades; the latter system gained wide circulation under the name of its developer, Felix von Luschan. These methods were an improvement over arbitrary color naming, but they failed. Matching methods arbitrarily divided the continuum of skin tones into discrete shades, and the measurements were hard to reproduce from one observer to another because the tiles looked different under different lighting conditions, and matches with skin tone were often judged differently. Because of the inaccuracy of these methods, and the benighted motivations of some of the people using them, the study of skin pigmentation and skin color inheritance lost direction and intellectual integrity during the early twentieth century. A more objective and reproducible method was skin-color measurement using reflected light of specific wavelengths, often called reflectometry. The principle of skin reflectometry is simple. The reflectometer determines skin color by shining light through filters of different colors onto the skin and measuring the amount of light that is reflected back. Each colored filter allows light of a specific wavelength of the visible spectrum to pass through. Skin color is measured by the percentages of the different wavelengths of light reflected. Light skin reflects more visible light of all wavelengths than dark skin and gives higher reflectance values, but different skins reflect different amounts of different wavelengths (box 3). Darker-toned skin absorbs more short-wavelength (blue) light than long wavelength (red) light. Lighter skin absorbs less blue light and more red light. Over the past sixty years various kinds of portable reflectometers have been invented to make it easier to measure skin pigmentation in field situations and in doctors' offices. Our skin "tans" when exposed to strong, UVR-containing sunlight, but some of us develop a much darker tan than others. (Tanning as a series of physiological responses to UVR exposure is distinct from suntanning as a recreational activity, which I refer to as recreational tanning; see chapter 14.) Everyone, regardless of skin color, has about the same number of melanocytes, but people with naturally dark skin possess melanocytes that can produce about four times as much melanin as those in people with lighter skin. Higher melanin content offers more protection against damage to DNA and other important molecules. The fourfold difference in melanin content between darkly pigmented and lightly pigmented people translates into a seven- to eightfold difference in protection against damage to DNA, but even the darkest skin does not protect a person completely. Even very low UVR exposures cause measurable DNA damage. Most people have sufficient melanin in their skin to produce a good natural tan, but some people with lightly pigmented skin make very little melanin to begin with and cannot produce more. They have lost the ability to tan, even if exposed to prolonged or intense UVR. Instead, their skin reacts to the radiation by mounting a strong inflammatory reaction-sunburn. The redness, heat, swelling, and pain caused by sunburn are symptoms of the damage-control reaction, which is the skin's response to excessive UVR. At the cellular level, damage can occur to epidermal keratinocytes; to numerous cells in the dermis, including the resident immune cells; and to the delicate linings of the tiny blood vessels or capillaries in the skin. (Damage to capillaries causes them to leak fluid that creates blisters on the skin surface.) At the chemical level, the immune response causes molecules to be released from skin cells that cause inflammation, pain, and itchiness. From the skin's point of view, a sunburn is a disaster. Even after the redness and pain subside, the damage persists. The connective tissues in the skin and the DNA in skin cells have been seriously harmed, leading to premature skin aging and possibly cancer if the impaired DNA cannot completely repair itself. Tanning is a complex process that takes place over days and weeks if exposure to the sun persists (figure 4). For some people, the skin's first response to strong sunlight is the rapid development of grey-brown blotches. This reaction, which can cause alarm to the unwary sunbather, is known as immediate pigment darkening (IPD) and is still not well understood. It occurs mostly in people who already have a moderate amount of melanin in their skin. It appears to involve not the production of new pigment but rather the redistribution of existing melanin. The color produced by IPD mostly disappears soon after sun exposure stops. What we think of as normal tanning is known to dermatologists as delayed tanning to distinguish it from IPD. During delayed tanning, melanocytes are mobilized into vigorous long-term action. Most of the visible darkening that occurs within the first week of sun exposure results from the upward movement of melanin already present in the epidermis, not from newly produced pigment. Increases in melanin production occur later, as chemical reactions gradually increase within melanocytes. Chronic exposure to UVR, like that experienced by many outdoor workers, can result in a near doubling of the skin's melanin content. This is brought about by increases in both melanin production and the number of melanocytes. In people with naturally dark skin, the tanning reaction starts with a dramatic mobilization of melanin upward in the epidermis and continues with increased production of melanin. This reaction accounts for the fact that naturally dark-skinned people get visibly darker after a week or more of sun exposure and then lose the added color over months if they stay out of the sun. Does tanning really help protect the skin against the harmful effects of sunlight? Some people think it does and attempt to "build up a good tan" early in the summer to protect themselves from a long season of heavy UVR. Unfortunately, a heavy tan affords little more protection than what is provided by naturally dark skin. Tanning does increase melanin content, but this alone does not confer protection from UVR damage. The skin of a naturally darkly pigmented person affords great protection against UVR because of its higher melanin content and the larger and denser caps of melanosomes that protect the DNA within the living skin cells, and because the pigment in dark skin is mobilized faster from deep in the epidermis to a position closer to the surface. In this position, the melanin can more readily absorb UVR that would otherwise damage DNA and other vital molecules. Thus it is not just the abundance of melanin but also its location that determines how much protection it affords. In prehistory and in early historical times, people tanned in the course of their daily activities. Our ancestors slept in natural shelters or simple huts and spent their days outside acquiring food through gathering, hunting, herding, fishing, and farming. Tanning was part of the skin's adaptation to seasonal changes in the intensity of sunlight. Today, most people in industrialized countries live and work indoors and get only casual exposure to strong sunlight during their normal activities. Seasonal tanning has become a process that people have to seek out and is done mostly in the context of relaxation and recreation (see chapter 14). People fade with age. In people over thirty, the number of active melanin-producing cells decreases on average by about 10 to 20 percent per decade as melanocyte stem cells gradually die. The skin of the face and hands, which is routinely exposed to UVR, has about twice as many pigment cells as unexposed skin, probably because chronic exposure to sunlight continues to stimulate melanocytes. The uneven or blotchy appearance of the hands and faces of older people is due to the loss and uneven distribution of pigment cells and to changes in the interactions between melanocytes and keratinocytes. Darkly pigmented people tend to exhibit fewer signs of aging in their skin than the lightly pigmented because their built-in sunscreen protects them from most photoaging (aging caused by sunlight). Both of the women in figure 5 belong to the Herrero, a group from southwest Africa. The women are the same age, but the woman on the left had a German father. Her lighter skin left her more susceptible to photoaging: the resulting deep lines and wrinkles on her face make her look much older than her companion. Age-related changes in skin color wouldn't matter much if it weren't for the fact that humans are highly visually oriented animals, like all primates. We critically assess the appearance of other members of our species immediately, unconsciously, and without introspection, and we draw conclusions about their age, attractiveness, and health on the basis of what we see. Recent studies have shown that evenness of facial skin color is one of the main criteria influencing judgments of female attractiveness, age, and-in particular-health. Fewer color irregularities connote better health, general physiological well-being, and greater reproductive potential. These findings drive the continued development and marketing of creams and preparations that can make skin more evenly colored and encourage women and men to protect their faces from sun damage in the first place. 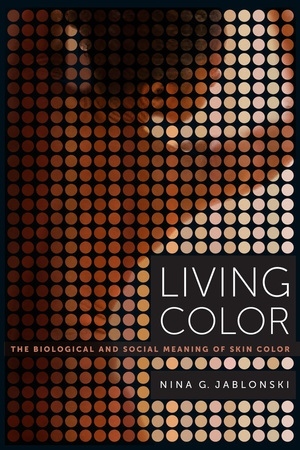 Living Color is the first book to investigate the social history of skin color from prehistory to the present, showing how our body’s most visible trait influences our social interactions in profound and complex ways. In a fascinating and wide-ranging discussion, Nina G. Jablonski begins with the biology and evolution of skin pigmentation, explaining how skin color changed as humans moved around the globe. She explores the relationship between melanin pigment and sunlight, and examines the consequences of rapid migrations, vacations, and other lifestyle choices that can create mismatches between our skin color and our environment. 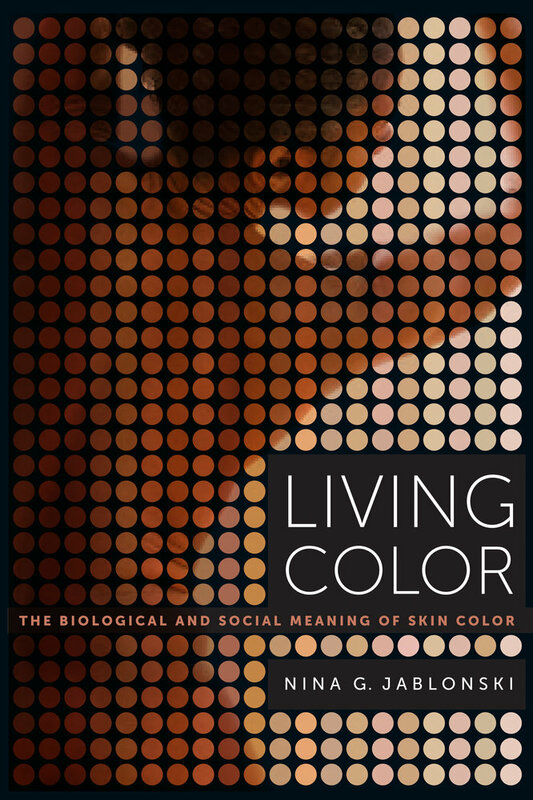 Richly illustrated, this book explains why skin color has come to be a biological trait with great social meaning— a product of evolution perceived by culture. It considers how we form impressions of others, how we create and use stereotypes, how negative stereotypes about dark skin developed and have played out through history—including being a basis for the transatlantic slave trade. Offering examples of how attitudes about skin color differ in the U.S., Brazil, India, and South Africa, Jablonski suggests that a knowledge of the evolution and social importance of skin color can help eliminate color-based discrimination and racism. Nina G. Jablonski is Distinguished Professor of Anthropology at Pennsylvania State University. She is the author of Skin: A Natural History, (UC Press), and was named one of the first Alphonse Fletcher, Sr. Fellows for her efforts to improve the public understanding of skin color.